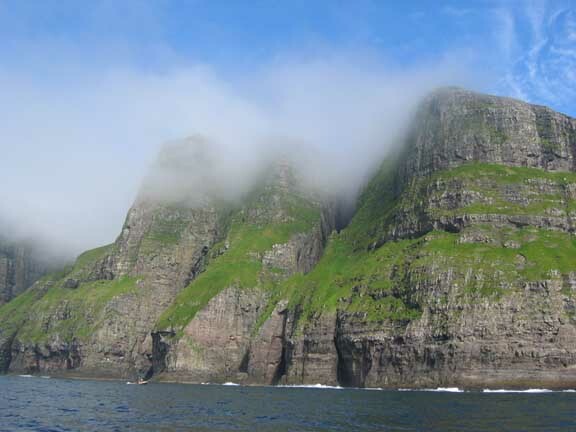 The Weather : The first few days were great - can we get rid of the sea mist that hangs over Faroes ? 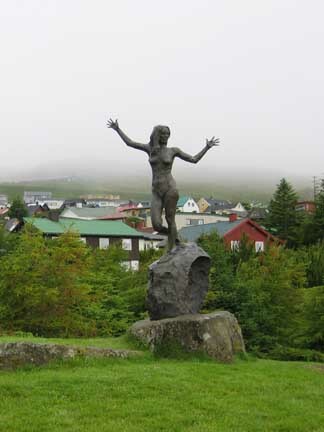 Having completed our first major sea crossing (we had reached Faroese soil at Suderoy) we now motored a few hours north to the main port Torshavn, the capitol city of Faroes . 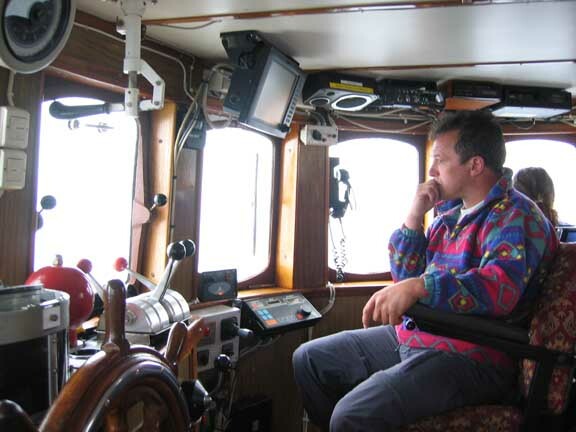 This was the first time Mark had navigated to these ports. With the help of the Harbour Master we were able to find a suitable birth for our boat first time. 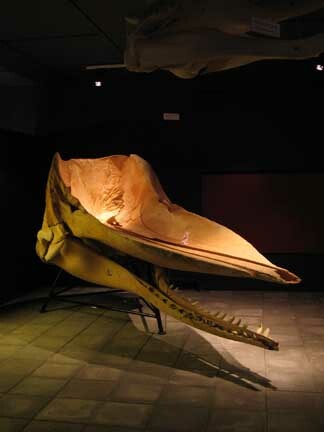 She has a waterline length of about 30 metres and draws 3.1 metres of water and so needs a little more consideration when birthing than "just put it over there somewhere". We aimed for the squarish grey building to the right of the Tingane Peninsular's red buoy. 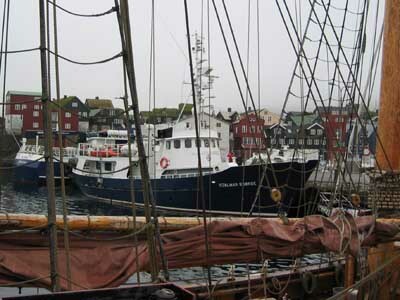 Hjalmar Bjorge safely berthed right at the centre of town - a brilliant location. 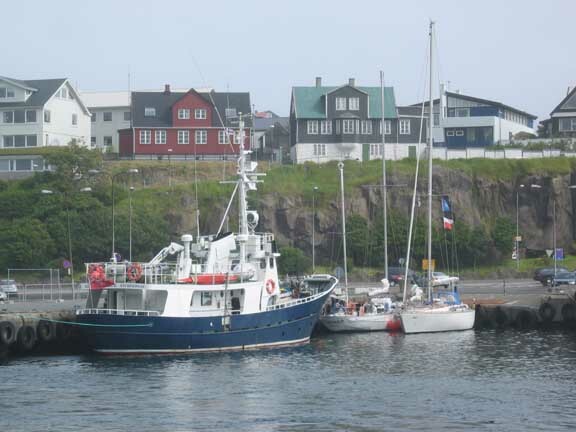 The town is very boat orientated, from the ferry in the foreground, to the fisheries, the boatyard and the large marina for both private fishing and small leisure boats. 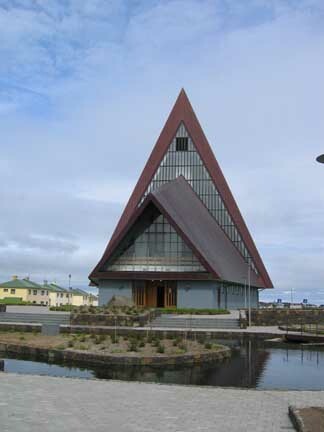 The pyramid in the background is the spire of the modern cathedral. 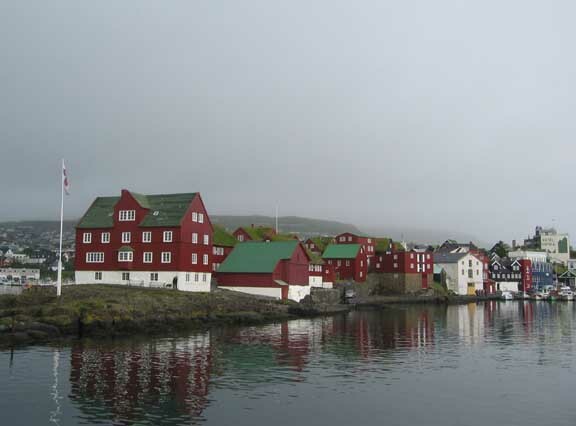 The Tingane, on the peninsular opposite, hosts the oldest buildings of Torshavn. 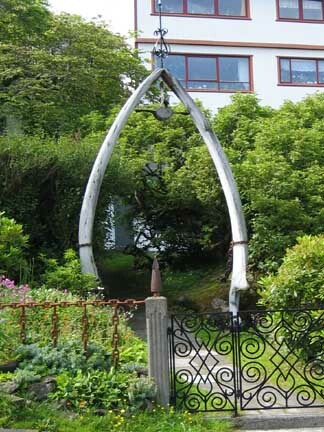 The original Norwegian settlers established their Parliament on this site during the eighteenth century and the buildings must date from about that time and some of these still have turf roofs. The Parliament meet there to this day. The Prime Minister's office is the one with the second flagpole towards the back. 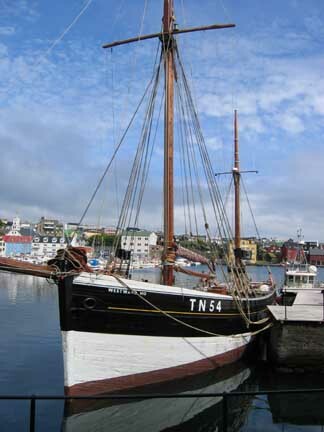 A twin masted ketch in the harbour. 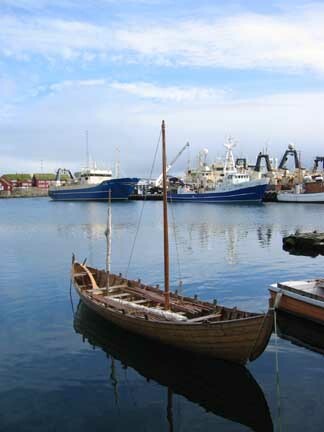 A Norwegian influenced rowing / sailing boat. 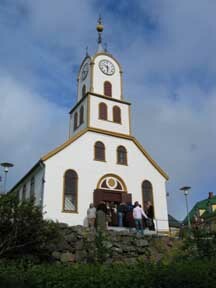 Torshavn Cathedral - The tallest building in the city. 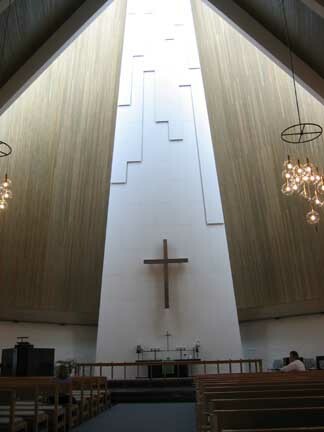 The glass adds dramatic lighting on the alter inside. 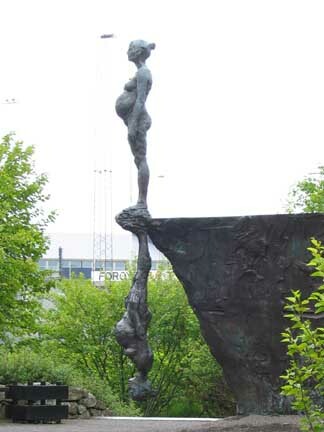 Vidarlundin Park and Sculpture Centre. 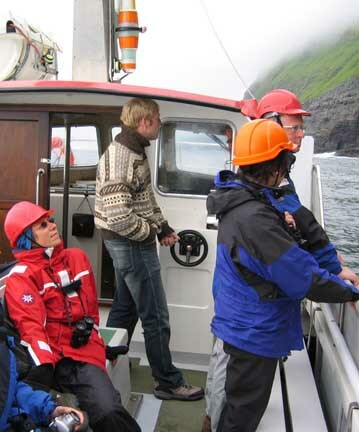 We spent two nights in Torshavn and the second day we took Andy and Gavin's suggestion of a bus ride to Vestmanna, where we had a small-boat trip out to see the bird cliffs, and spectacular sea stacks, on Streymoy's north west coast. A grey start turned into a fine sunny day and the cliffs topped with cloud looked even more dramatic on the way back. 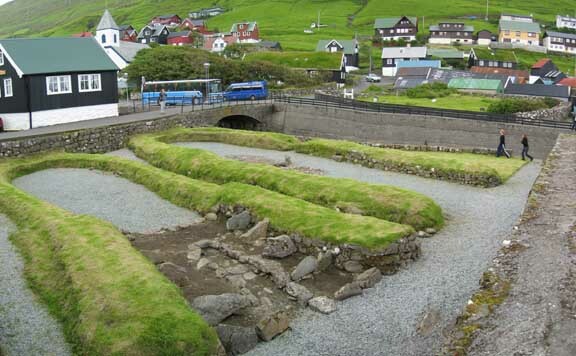 Here archaeologists have uncovered an ancient Viking homestead, complete with barn, cattle stalls and long house. 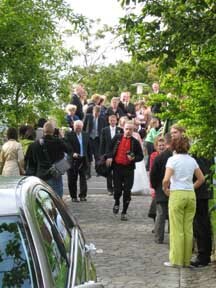 Back in town we were dropped of near the harbour, and whilst walking back to the boat we heard the church bells celebrating the completion of a local marriage. 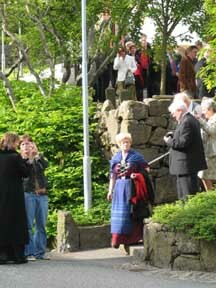 The Bride and Groom wore a European style of dress but several of the group were wearing traditional Faroese outfits, which were delightful. Back on the boat for the second night. We enjoyed time ashore after dinner, sampling the delights of the local beer. Local currency was exchanged and purchases made, but at four or five pounds a pint, the beer was drunk rather slower than normal ! 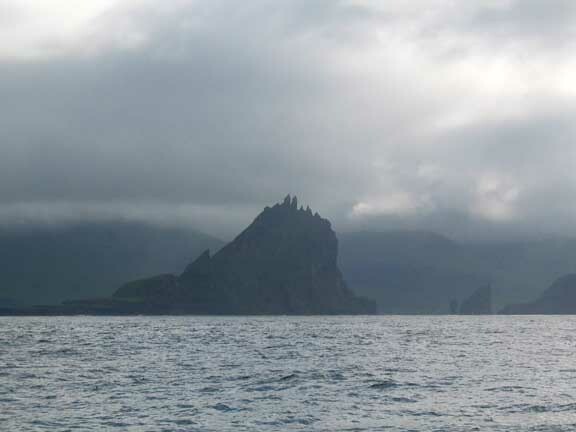 After an early start, 6 am from Torshavn, we sailed south and then west through the Hestsfjordur Sound and out to the western most island group of Mykines. The early morning light and shades of grey added drama to the spectacular cliffs and island scenery. 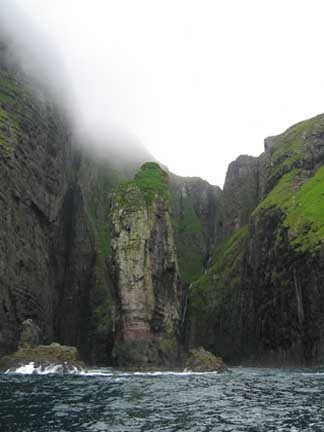 Tindholmur Island, part of the Mykines group, and the western most part of Faroes. From here on it was open sea.
" Iceland is out there somewhere "
Mark, the skipper, contemplates the voyage ahead ! 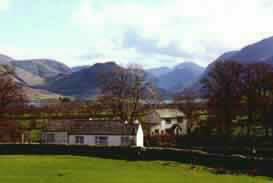 This site best viewed . . . with guide book and some idea of what you want to see.